St. Louis County is a suburban county that rings the City of St. Louis on the north, west, and south, but does not include it. It includes more than 100 municipalities, some with tens of thousands of residents, others as small as a couple of blocks, and it also administers unincorporated area. St. Louis County published its Greenhouse Gas inventory in 2009, using 2008 as its baseline year. 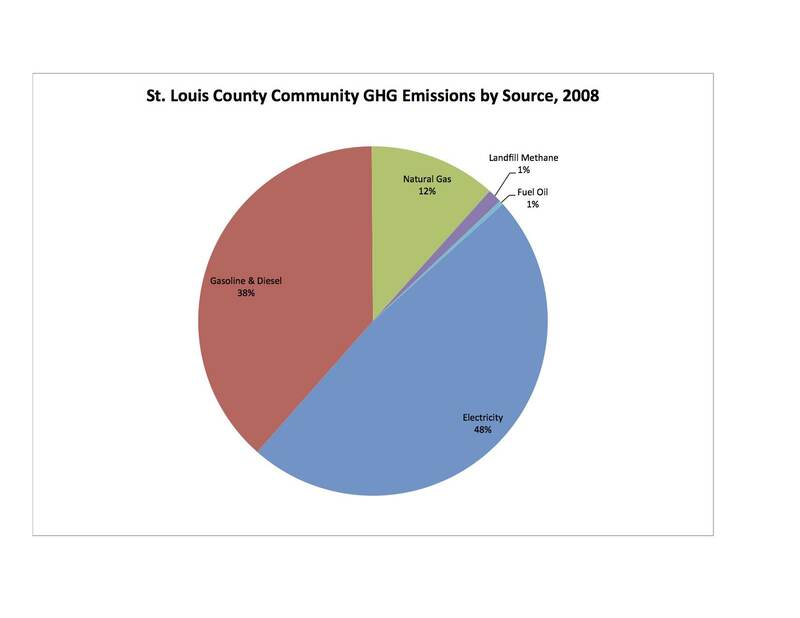 Total community emissions for St. Louis County in 2008 were 23,520,171 MTCO2e. The report states that population was 994,098, yielding an estimate of 23.66 MTCO2e per capita. The first graph on the right shows community emissions by sector. Emissions caused by transportation were the largest source, accounting for 38% of total emissions. Almost all of it came from cars and trucks; only a tiny fraction, barely visible on the graph at right, came from the Metro Transit system. Commercial buildings emitted 27% of the total, while residential buildings emitted 26%. Most GHG inventories that I have seen do not construct an emission total for the built environment. It is, however, one of the largest sources of GHG emissions, and it is one of the sectors where energy efficiency, and hence GHG reduction, is least difficult. In this inventory, and in most of the others we have examined, the emissions from the commercial and residential sectors come from buildings, and the sectors can be summed to estimate emissions from the built environment. 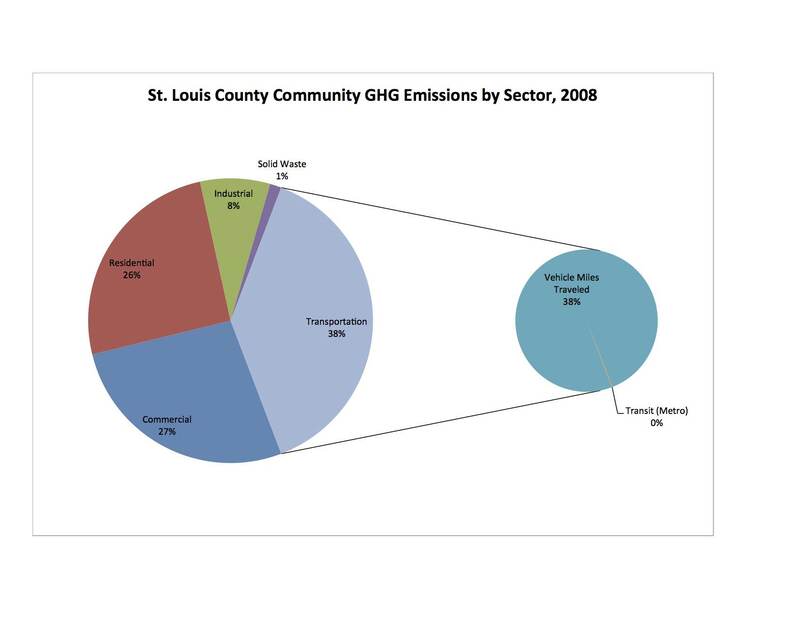 In St. Louis County, the commercial and residential sectors sum to 53% of total emissions. Electricity was the largest source of GHG emissions in St. Louis County in 2008, accounting for 48% of total community emissions. It was followed by transportation fuels (gasoline & diesel), which together accounted for 38%. The inventory estimated that there were slightly more than 403,000 households in the county. Given that many of them use natural gas for heating, hot water, and/or cooking, it is remarkable that natural gas accounted for only 12% of emissions. 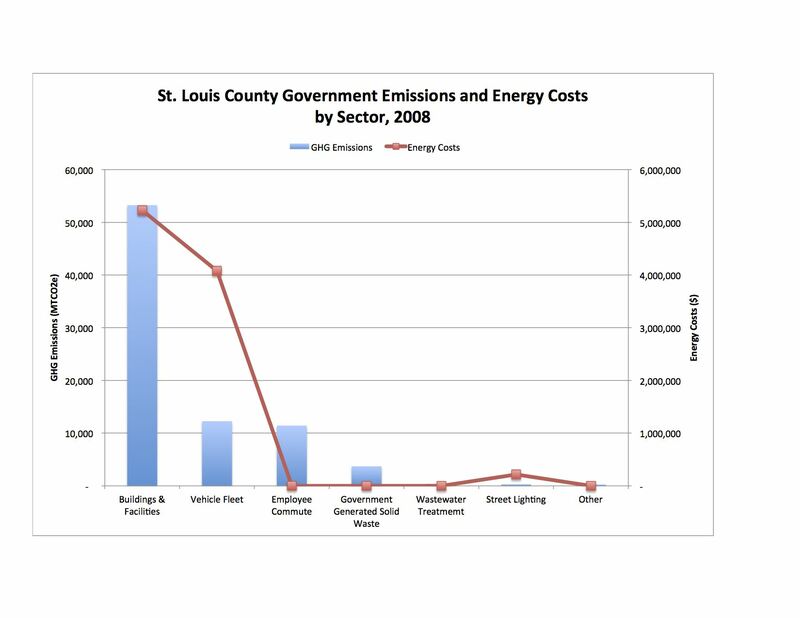 St. Louis County studied government emissions and energy costs in 2008, but did not report energy consumption. Not all departments reported their energy costs, so the estimates represent a lower limit, and actual costs were most likely somewhat higher. Looking at emissions by sector, buildings and facilities emitted by far the largest amount of GHG, more than four times as much as the next largest sector, vehicle fleet. However, as we have seen in some other inventories, the disparity in cost between buildings and fleet was not as great as the disparity in emissions. I believe that the reason for this pattern has to do with the energy sources used by the two sectors. Buildings tend to consume a lot of electricity, which is relatively inexpensive, but which tends to release a lot of GHG per unit of energy. Fleet, on the other hand, uses gasoline and diesel, which are more expensive, but less GHG intense. 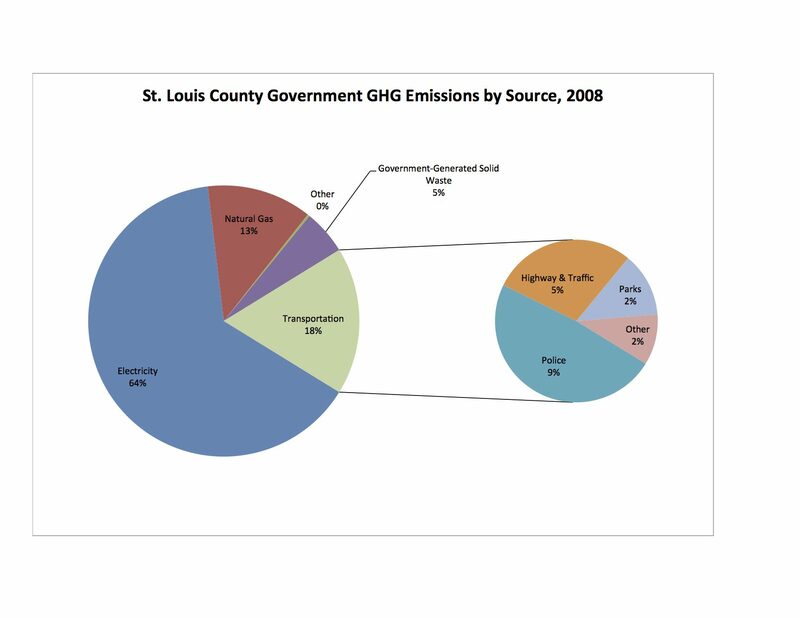 In terms of sources, electricity accounted for 64% of St. Louis County’s GHG emissions. Together, transportation fuels (gasoline, diesel, and LPG) accounted for about 27% of emissions. However, almost all of the transportation emissions were from gasoline, with diesel and LPG accounting for very small fractions. The implication is that virtually all of St. Louis County’s vehicle emissions come from cars operated by county personnel, and very little comes from large trucks or off-road equipment. The graph at right show that police vehicles were the largest source of vehicle emissions. This matches findings from some other GHG inventories, for instance Creve Coeur, although the reports seldom present the data in a form that can be used to show this analysis. I am no longer able to find the St. Louis County Greenhouse Gas Emissions Inventory Baseline on the St. Louis County website. A summary of some of the information is available at http://green.stlouisco.com/GreenhouseGasInventory. Those needing a copy are welcome to contact me by leaving a comment here on the blog. By mogreenstats in Climate Change on 2013/02/04 .